This remarkable motorbike looks like it’s straight out of a film set – but remarkably an artist has made it out of spare parts. The Bangkok worker used recycled materials from old cars and bicycles to create a monster machine which is sculpted to look like a beast. Despite being cobbled together from scrap parts, the spectacular motorcycle works – unlike many sci-fi film props. 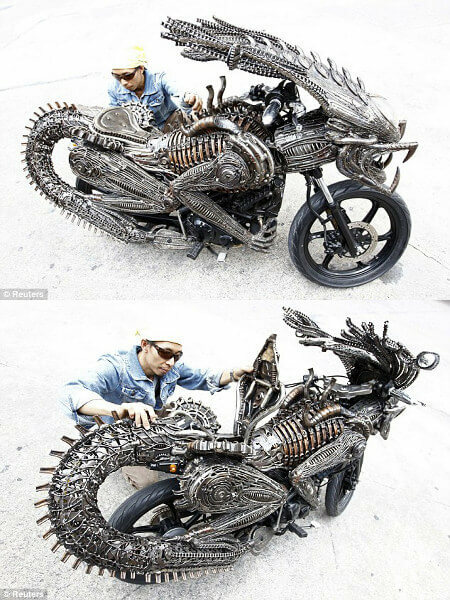 Roongrojna Sangwongprisarn, 54, created it out of spare parts in his workshop in Thailand. He has four shops across the country – named the Ko Art Shop – and exports his creations to clients all over the world. FBI Confirm Aliens Exist – Released Declassified UFO Documents & Files – Who Is The Real Threat To Earth?